How silly is Saints Row IV going to be. Well, let's look at what's inside its announcement trailer. A guitar-shaped rocket launcher. This is quite silly. Superpowers. This is very silly. A head-expanding laser beam. Positively batshit. A skyward launching nutshot. Just... ouch. A giant, mutated, rampaging mascot. I think I'm becoming desensitised. An announcement date of August 20th for the US, and August 23rd for the UK. More informative than silly, really. There's a definite pattern emerging. Frankly, I'm delighted. 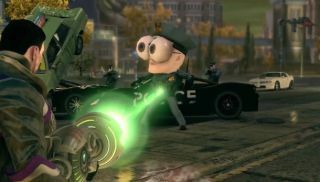 Saint Row: The Third was one of those games so unapologetically ridiculous that it snapped back on itself and became a uniquely warped kind of genius. It's nice to see Volition and Deep Silver really test how far they can push that.